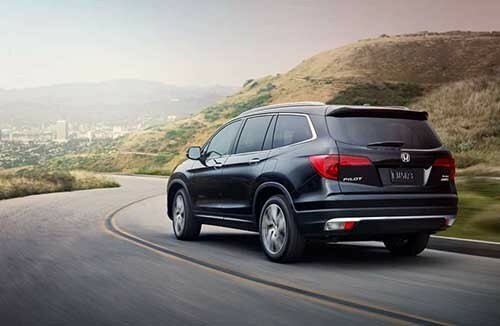 When parents in Edison are looking for their ideal SUV, they’re likely to put safety at the top of their list of “musts.” The 2017 Honda Pilot is a commendable family vehicle for a lot of reasons, including the fact that it earned a 5-star safety rating from the NHTSA* and a Top Safety Pick+ rating** from the IIHS. Find out how the Pilot earned those scores, and then make the trip from Union to finance or lease the new Honda Pilot from VIP Honda! Using advanced sensors, this system is able to register when a collision is about to occur and is able to intercede by braking in order to reduce the chances and impact of the collision. This feature can detect when your vehicle is about to move off the road and can make corrective measures to ensure that doesn’t happen. Should the Pilot start to drift out of the lane, this system will send out a warning and then gently move the vehicle back to the center if you don’t do it right away. At highway speed, Adaptive Cruise Control is able to keep a safe and steady distance between your vehicle and the vehicle in front of you so that you don’t have to keep braking and accelerating on your own. The 2017 Pilot is also offered with a range of other safety features that will make things easier on the driver and safer for passengers. Get a full view of what’s around you with the Multi-Angle Rearview Camera with dynamic guidelines, and avoid a dangerous situation thanks to the available Blind Spot Sensing system. The 2017 Honda Pilot is ready to set your mind at ease when you’ve got a van full of kids in North Plainfield. Come in and check out our current selection of new Honda Pilot SUVs located near Edison at 765 US-22 in Plainfield, NJ. You can get pre-qualified for a loan right now, and you can contact our sales team contact our sales team online or by phone at 908-753-1500. **The 2017 Pilot with available Honda Sensing® and LED Headlights earned a 2017 TOP SAFETY PICK+ from the Insurance Institute for Highway Satfey (IIHS) for crash safety performance.